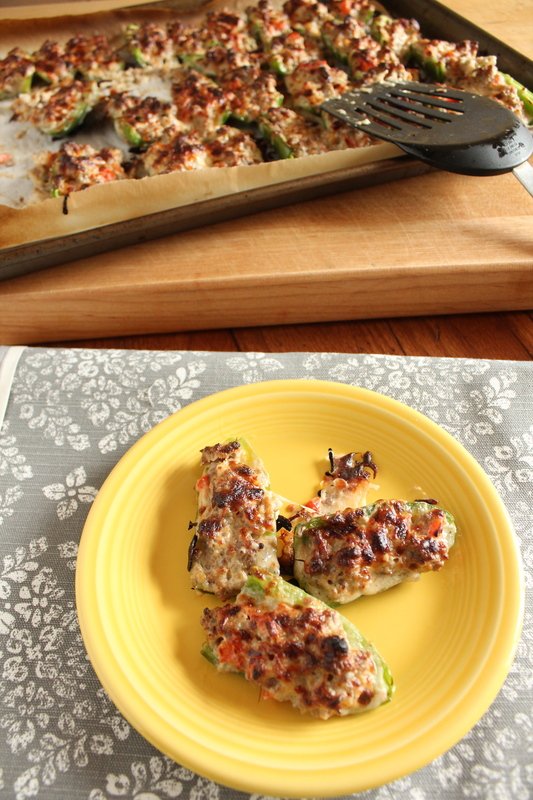 Holy hot fire, these stuffed jalapeños are good. I’m not lying. I pounded down 15 of these spicy green gems the other night. That’s right. I said it. FIFTEEN! I’m surprised my stomach wasn’t a burning hole of fire the next day. I love spicy food! Like, sweat-while-you-eat spicy. That’s probably why I adore mexican and tex-mex food so much. These jalapeños are loaded to the brim with a delicious cheese and sausage mixture, and then topped with, you guessed it, more cheese. Hello, cheese! My husband tried to tell me they were too cheesy. Uh, too cheesy? Is there such a thing as too cheesy? The answer is “NO!” There is indeed no such thing as too cheesy. I took a vote, and it just doesn’t exist. Yet, he proceeded to eat the remaining stuffed peppers. Too cheesy my arse. Okay, I’m going to let you in on a little secret. I love brown, charred cheese. It. Is. Good. Guess who was picking at the bits of crispy, browned cheese and waving them around saying “This is my favorite part.” The same man who said the words “too cheesy” in a sentence. 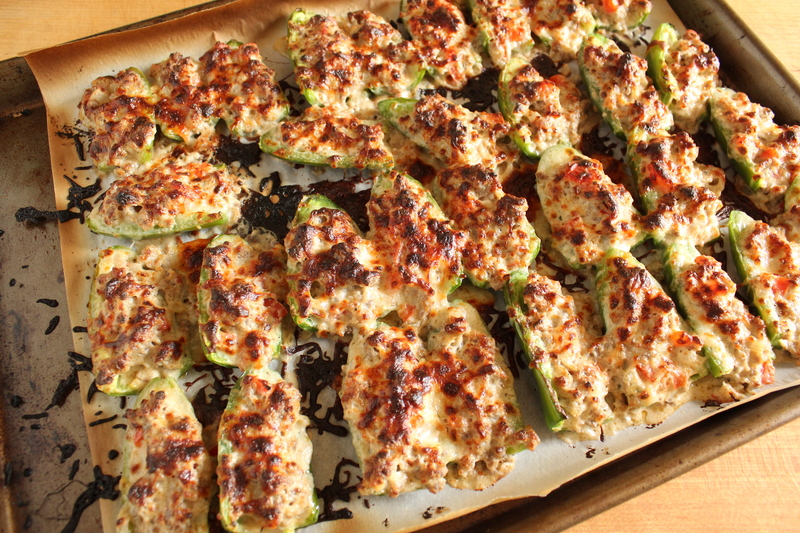 I have made these stuffed jalapeños numerous times. They’re a favorite at parties, dinners, and barbecues. There are never any of these left over. So, if you had hopes on taking the leftovers home for a midnight snack, you’re setting yourself up for disappointment. There won’t be any. I’m sorry. 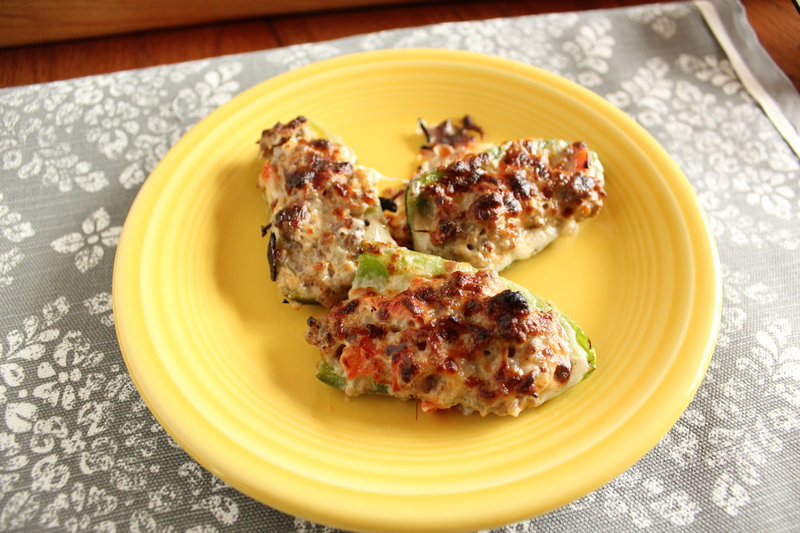 If you like spicy, you’re gonna adore these stuffed peppers. Don’t worry, they’re not knock-your-socks-off hot, but they do pack a small punch. They have more of a warm, lingering heat. And, if you eat enough of them, you may notice a few beads of sweat gathering on your forehead. Enjoy! Preheat oven to 375 degrees F. Line a baking sheet with parchment paper or aluminum foil. Place the jalapeño halves on the sheet. In a large bowl, add the softened cream cheese, worcestershire sauce, Tabasco sauce, parmesan cheese, seasoned salt, kosher salt, and black pepper. Stir to combine. In a large saute pan, heat 2 tbs. of olive oil. Add onions, red pepper, garlic, and red pepper flakes, and a pinch of salt and pepper. Cook for 3 minutes. Add the hot sausage, making sure to break it apart as it cooks. Cook until sausage is no longer pink, about 5-7 minutes. Add the cooked sausage mixture to the bowl with the cream cheese. Stir to combine. With a spoon, scoop the cream cheese mixture into the jalapeño halves. Top the peppers with shredded mozzarella cheese. Bake at 375 degrees for 8-10 minutes. Turn the broiler on hi, and broil just until the cheese chars a bit and turns brown. Serve. Done! Next party, you’re invited. I’ll make a double batch. Thanks, Jenn. They are so good. I bet Seth would love them. I’m sorry, tell your hubby he’s been outvoted. There is indeed NO SUCH THING as too cheesy. Puh-lease. Things can *maybe* be too sweet, or two sour. But, NEVER too cheesy. Now that that’s out of the way…ummm…girl, I’ve got your back at 15! Go girl! I’m thinking after seeing these, Yeah….I’m probably good for anything leftover! YUM! Thanks, Jen. I know, right! Too cheesy. That’s crazy talk. Hahah o man, I needed to whip out the tums just to finish reading this, these look AWESOME! My wimpy stomach needs to man up because I need some of these in my life, loveee the charred cheese, looks amazing! wow ! Loving this recipe . Yum!! Next time, try taing half a slice of bacon and wrap it around it before cooking. Thanks for the bacon idea. That really sounds like it would be amazing. No such thing as too much cheese! These sound amazing! I need to make these asap! Thank you. No, never too much cheese. I have to agree with the above comments. . .NEVER too much cheese! :) My husband would love these! I will definitely be bookmarking this recipe for future use! I will need to try this version. I have made these before but yours do look exceptionally cheesy -which is a good thing. Ha-I will make a not to count how many I eat-yum! Too much cheese, that is like saying you have too much gasoline for your car…Enjoy the weekend! Thanks, Tina. They are spicy and cheesy. I’m warning you, they’re addictive. Enjoy your weekend, as well. I definitely like it hot! These would be an awesome party snack! I make them a lot during football season. The guys love them. If you like it hot, you’ll love these. I’m addicted to them. Need.these.ASAP! Your shots make me hungry!